On Sale Now! 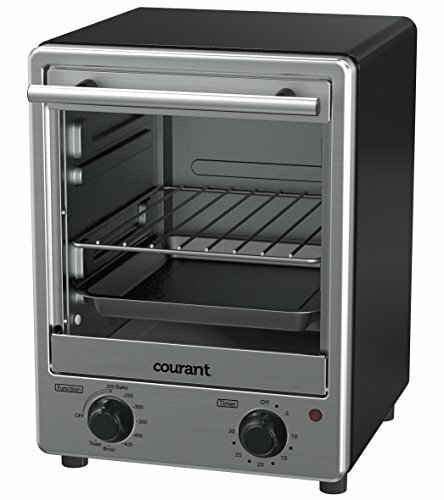 Save 5% on the Courant Stainless Steel Toaster Oven with Tempered Glass Door and Galvanized Interior by Courant at Baking Love. MPN: COUTO1236. Hurry! Limited time offer. Offer valid only while supplies last. Cook with convenience while making snacks or entire meal by keeping an eye on your food through the tempered glass door of automatic toaster oven. Cook with convenience while making snacks or entire meal by keeping an eye on your food through the tempered glass door of automatic toaster oven. Stainless toaster oven includes an auto shut-off mechanism and galvanized interior for safe use. Bake, broil and toast up some sublime snacks as per your choice with slightly altered function. Take pleasure of countertop cooking versatility with stainless steel toaster oven. The toaster oven black comes with a removable crumb tray allowing user to have an easy and quick cleanup. The oven also includes a bake pan and toasting rack to accommodate all types of recipes without any hassle. Easy control: stainless toaster oven allow user to set function and temperature as per his requirement. Removable Crumb tray: Existence of crumb tray ease in 4 slice toaster oven allow user to variety of meals with assured hygiene. Liven up your kitchen with Glass Door toaster oven!! If you have any questions about this product by Courant, contact us by completing and submitting the form below. If you are looking for a specif part number, please include it with your message.